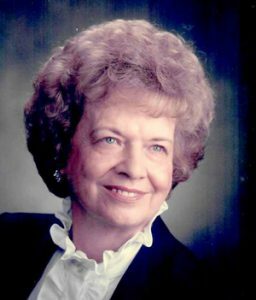 M. Roberta “Bertie” Lesh, 97, of Bluffton passed away on Monday evening, Oct. 22, 2018, at Ossian Health and Rehab Center. Roberta was born March 9, 1921, in Muncie to Ralph and Amelia Gibson Milligan. Bertie graduated from Rockcreek High School with the class of 1939. She worked at Caylor-Nickel in the laboratory and research department for many years. She was a longtime member of St. Paul Lutheran Church, where she played the church organ and piano for more than 50 years. On Jan. 27, 1946, at the St. Paul Lutheran Church, Roberta and Ray G. Lesh were married. They have shared the last 72 years of marriage together. In their later years, both Ray and Bertie ate at the Corner Depot daily, and enjoyed the chance to visit with others. Survivors include her husband, Ray of Bluffton; children, David E. (Robin) Lesh of Land of Lakes, Fla., Linda (Bill) Schaefer of Greentown, Bruce A. (Fran) Lesh of Bluffton and Kent M. (Kelli) Lesh of Bluffton; along with 10 grandchildren, 13 great-grandchildren and two great-great-grandchildren. She is also survived by a brother, Bob (Barb) Milligan of Florida. She was preceded in death by her parents and two sisters, Helen Cloud and Virginia Winningham. Funeral services will be held at 11 a.m. Saturday, Oct. 27, at the Thoma/Rich, Lemler Funeral Home in Bluffton. Rev. Lyle Breeding will officiate. Calling hours will be held from 4 to 7 p.m. Friday, Oct. 26, at the funeral home. Burial will follow at St. Paul Cemetery in Wells County. Memorials may be made to the St. Paul Cemetery Association through the funeral home.